Truly great news for Denver tikiphiles — the excellent Hula’s Island Grill and Tiki Bar, which has been enormously successful in Monterey, California, has decided to open a location in Denver. The new place is coming on August 1st to South Broadway. It will be a full bar and restaurant, and will likely be even tiki-er than the Monterey spot. 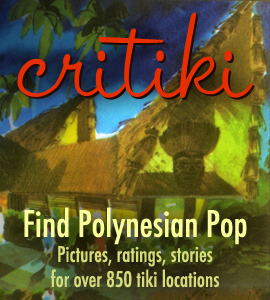 When chatting with one of the owners during a visit last summer, I learned that they were eager to do a second location in another town, and they planned to incorporate a vintage Polynesian Pop feel from day one (the Monterey Hula’s has a very tiki side room that they added on a couple years ago, but the core restaurant is more casual). Denver, you lucky, lucky dogs. The food at Hula’s is delicious — easily the best food I’ve ever had at a tiki restaurant. The Mai Tai I was served was nearly spot-on, and we dined in the shadow of a very large Tiki Tony carving, and beneath some lovely reproduction black velvet paintings. The service was friendly, and the music and lighting were great. As far as I’m aware, there is no connection between this place and the new Tiki Boyd’s that is in the works. The past year has already seen some dramatic movement in the local Denver tiki scene, and this news is the best yet. If we didn’t have Forbidden Island opening here in the Bay Area in just a couple weeks, I’d be downright envious. It was said that Hula’s was the only Tiki plase in Colocrado, not any more!! The Lost Dog Bar & Lounge has a Tiki Bar in the back patio full of Tikis, waterfall and live bamboo. The place were Durangos night life lives!!! YES!! This is awesome news!! I’m another tiki-phile here in Denver, who’s even plotted to open a real Tiki Bar here in Denver herself. But alas, I’m broke, and lack appropriate business savvy. But this smacks of the kind of Tiki I long for! Thanks for the info!